The millennials are in all the way a smarter lot, not only do they choose the right course during their freshmen years, but, they also look out for courses – mainly short-term courses, which help them build their education and professional qualification. 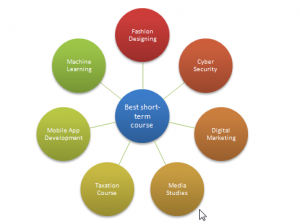 So, what are the short-term courses all about? Let us dive deep into the subject to understand the importance of pursuing them. Short-term courses are education programs that run for a short period of time, mainly for few weeks or months. The main motto of pursuing short-term course is to enhance the students’ qualifications that in turn help them to improve confidence level in competitions of daily life. Short-term courses act as a bridging gap between knowledge and skills, they tend to keep you updated on the new happening in the industry. Not only does short-term course helps in providing additional knowledge for the betterment of the student’s future, but they also sharpen the skills of the students, thus keeping them at the competitive edge. Short-term courses help students to explore their field of interest. As short-term courses are loaded with practical knowledge, it helps the students get hand-on-experience. It is imperative for us to know that a mere graduation degree is not enough for this competitive world. Hence, it must be noted that the main concern is to choose the best job-oriented short-term courses that are available for a short period of time. These courses not only boost the students’ professional skills but also help them to move up the corporate ladder.